Size: sheet 28.5"x30"; design 25.5"x26"
We’re in love with this amazing mosaic tile pattern from France! Based on a real historic floor tile spotted on Rue du Faubourg, Paris, this mosaic stencil can transform your boring old floor into a painted floor masterpiece! This mosaic stencil pattern will look great on the accent wall too. Just imagine all the different color combinations you can do with it! Simply magnifique! We included a free mask stencil - a small stencil that will help to block out a scallop tile shape so you can add various colors without contaminating nearby areas. While prior stenciling experience is a plus for allover stencil patterns, even beginners get great results! Want to learn how to stencil a damask or allover pattern? 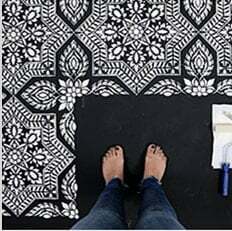 Here are the detailed illustrated step-by-step Damask/Allover Stenciling Tips. And make sure you watch our short step-by-step Video Tutorials! You'll find them extremely helpful for your stenciling project. Although our stencils do not require the use of spray adhesive, this stencil could benefit from it to help minimize paint seepage, especially if your walls have a slight texture to them. (Elmer's spray adhesive seems to be the best). Make sure you shake the can well and lightly mist (not drench) the stencil, and let it dry for a moment before positioning it on the wall. This step will prevent the adhesive residue transferring to the wall. You'll need to re-mist the stencil after a few repeats. Note: you will still need to hold the stencil in place with a few pieces of blue painters tape! Adhesive by itself is not enough to hold the stencil on the wall. Clean-up tip: Spray the stencil with Simple Green to help to remove adhesive residue. Please note that once you've used spray adhesive on your stencil, it will never really come off completely. That is why we personally prefer not to use adhesive, and instead use less paint on your roller or stencil brush.